Personalized Breath Mint Strips Dispensers in Bulk. Inexpensive, Promotional. Beso Prices in the USA, Canada. Bulk personalized breath mint strips in clear plastic dispenser. The plastic dispenser comes with 24 mint strips. Choose from six delicious flavors; Orange, Lemon, Strawberry, Peppermint, and Cinnamon Mint Strips. 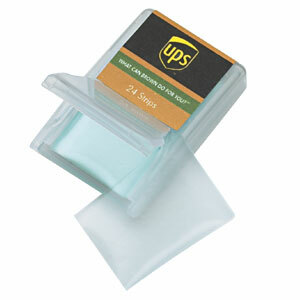 We also supply blank (not imprinted) breath mint strips for $0.89 each. Free artwork design. We will send you a proof for your approval before production. Budget Prices in USA and Canada for bulk promotional mint strips. American clients pay no taxes. Unit prices below include your custom imprint in full color (unlimited number of colors or color photo). Imprint: 1-3/8"w x 7/8"h on label. Mint Strip Flavors: Orange, Lemon, Strawberry, Peppermint, and Cinnamon: your choice, same price.